For age 30-60 years old. Deep Wrinkles 2. Fine Lines 3. Loss of Firmness 4. Loss of Tone 5. Lack of Plumpness 6. Tired Looking Skin 7. Uneven Skin tone 8. Also known as "The Tiger Herb", legend recounts that these majestic beasts would roll on the plant to heal their wounds. Hypoallergenic, dermatologically tested and suitable for sensitive skin. With age, skin has evolving anti-wrinkle needs. After the age of 45, cellular regeneration starts to slow down. Wrinkles progressively appear, the skin can lose firmness and contours are less defined. L'OREAL Revitalift Anti-Wrinkle Firming Night Cream, 50ml EACH. AND Night Cream 50ml each. Both are FULL SIZE products. The L'Oreal laboratories have developed a 3D Skin Quality Index for the eyes. Visible results: Suitable, conceals, illuminates Tired eyes look refreshed and brighter. Eye bags appear reduced. Age: 20 30 Texture: Tinted, refreshing cream. L'Oreal Paris Perfect Age Collection Gift Set Mature Skin New Brand New For £12! L'Oreal - Revitalift Laser Renew 50ml. Condition is New. Dispatched with Royal Mail 2nd Class. Comb or divide hair with fingers. Blow-dry or style hair with fingers for well-defined wavy hairstyles. L'Oreal Derma Genesis Cellular-Youth Nurturing Day Cream with SPF15 50ml. Condition is New. Dispatched with Royal Mail 2nd Class. 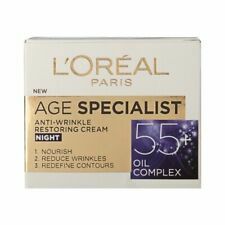 L'Oreal Age Perfect RE-HYDRATING Day Cream AND Night Cream 50ml EACH - NEW BOXED. Condition is New. Dispatched with Royal Mail 2nd Class. SEALED! 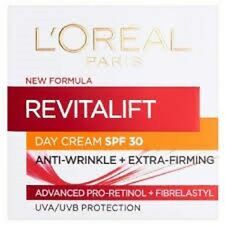 L'OREAL REVITALIFT FILLER REPLUMPING ANTI-AGEING DAY CREAM 50ML NEW! Rich Refortifying Night Cream, 50ml. L'OREAL AGE PERFECT GOLDEN AGE. & L'OREAL AGE PERFECT GOLDEN AGE. L'Oreal Paris Skin Perfection Anti-Fatigue Perk Up Cream Daily Moisturiser 35ml. L'Oreal Paris Age Perfect Re-Hydrating Lotion Face, Neck & Decollete SPF15 50ml. Condition is New. Dispatched with Royal Mail 2nd Class. Skin Expertise RevitaLift Complete Night Cream 48g. BLACK TRUFFLE & BLACK TEA EXTRACT. Black Truffle - a rare plant species characterized by longevity. RESTORATIVE SERUM 50 . Golden serum rebuilding a unique glow. CELL RENEW. Apply in a morning and in the evening on cleansed skin of your face. With age, skin has evolving anti-wrinkle needs. Revitalift Laser Renew contains a naturally-derived glycan (or complex sugar)-Pro-Xylane, which has been proven in a 6 month study to reduce the appearance of crow’s feet wrinkles, boost skin density and improve bounce. Imagine a new lease of life for your skin. Dry, tired, lacklustre-looking skin can make you look older than you actually feel. Skin gains vitality, tone and radiance for a healthy look. Also contains Pro-Calcium (a bio-compatible complex designed to protect the skin). NOURISH, SOFTEN, ILLUMINATE. FACIAL OIL. EXTRAORDINARY OIL. A LIGHTWEIGHT DRY OIL TEXTURE QUICKLY ABSORBS INTO THE SKIN FOR NON-GREASY RESULT, SUITABLE FOR ALL SKIN TYPES. LUXURIOUSLY BATHES SKIN IN COMPLETE COMFORT AND CARE. 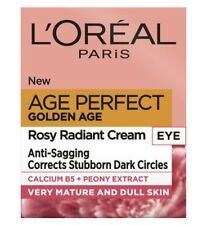 L'Oreal Youth Code Rejuvenating Anti-Wrinkle Eye. Rejuvenating Anti-Wrinkle Eye Care. For Wrinkles, Dark Circles & Bags. 10 Years Of Research. REVITALIFT LASER RENEW. ANTI AGEING GLYCOLIC PEEL PADS. 9.6% Glycolic Complex. Glycolic acid is a powerful anti-ageing active ingredient. 30 Pre Soaked Pads, For Daily Use. Follow with Laser Renew serum and cream. 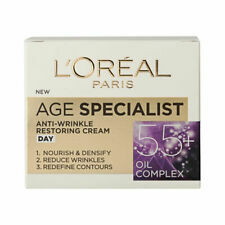 L'Oreal Paris: Age Perfect, Re-Hydrating Day Cream, 50ml. Condition is New. Dispatched with Royal Mail 2nd Class. REVITALIFT COMPLETE. WITH SPF 18 SUNSCREEN. All of our products are 100% genuine. Designed for very mature skin, from the age of 60, the body is less able to retain calcium.For the skin, this calcium deficit can weaken the cohesion of skin cells. Its specific complex is designed to provide calcium to the skin and help reinforce the skin's barrier function.ResultsThe eye and lip area appears younger-looking, plumper and more toned. What if could blur these signs of ageing, allowing to look younger in seconds. The Opti-Blur Technology diffuses light onto the skin to instantly blur wrinkles and dark circles around the eye area. The cooling applicator is clearly shaped for these delicate eye contours. This highly concentrated essence is sealed until use to preserve the benefits and freshness of the formula. After 1 ampoule, skin is tighter and more supple. L'ORÉAL TRIPLE ACTIVE 24h DAY CREAM. DRY AND SENSITIVE SKIN. 50ml. BRAND NEW UNOPENED SEALED IN BOX. This cream-mask provides hydration and continuous anti-ageing action through the night. Awaken the skin with more bounce while fine lines appear faded. Wake up with fresher, softer and more radiant skin. EXTRAORDINARY REPAIRING SERUM. AGE PERFECT INTENSIVE RE-NOURISH. MANUKA honey extract calcium B5. For mature, dry skin. REVITALIFT FILLER. Reduces Wrinkles: contains the highest concentration of Hyaluronic Acid formulated by L'Oréal Paris in a cream. Wrinkles appear reduced. CONCENTRATED HYALURONIC ACID. Hyaluronic Acid is a natural component of the skin. With a formula that's rich in Vitamin E and purified water, L'Oreal Professionnel Serie Expert Pure Resource Purifying Shampoo is great for keeping unwanted oil at bay. With an anti-hard water agent to help in any conditions, your hair will soon be feeling soft, clean and manageable.